Changes: pdf417 code support added. Press release: Mac Barcode Generator - iBarcoder 3.9.7 released, improvment Code 11, Code 93, MSI and more! 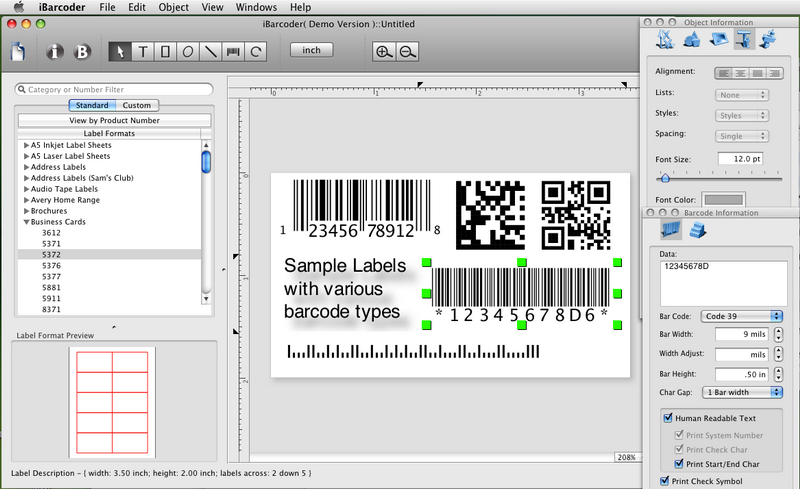 Professional barcode generator helps you create single mac barcode or serial barcodes easily. Code 11, Code 93, MSI, QRCode, ISBN, UPS, EAN, ITF14, Codabar and datamatrix barcode, GS1 Databar and PLANET barcode symbologies generator also available. Return Policy. 1.It is the responsibility of the Purchaser to fully evaluate the suitability of the product by downloading the unregistered restricted application. 2.Once the Purchaser pays for the product, he or she will receive a Key which will allow the user to activate a fully functional version of the product. Once the user the receives the Key, for distribution and refund purposes, the product is treated in the same way as a software product purchased at a retail outlet that has been opened (that is, the seal has been broken): We will refund the funds for the product, if the product is: (a) shown to be defective in some manner not revealed by the evaluation of the demo version, and (b) we do not repair the defect within 15 business days and provide to the purchaser a version of the product that is free from any reported defects. If we do not perform to remedy defects as specified in items 2(a) and 2(b), then we will fully refund the amount paid for the product. The refund will appear as a credit to the original credit card account against which the original charge was made. LICENSE AGREEMENT IMPORTANT: PLEASE READ THE TERMS AND CONDITIONS OF THIS LICENSE AGREEMENT CAREFULLY BEFORE USING ANY DEMONSTRATION OR FULL VERSION SOFTWARE OWNED BY CRISTALLIGHT SOFTWARE. AND/OR ITS SUBSIDIARIES (“CRISTALLIGHT ”). CRISTALLIGHT IS WILLING TO LICENSE SOFTWARE TO YOU AS THE INDIVIDUAL, THE COMPANY, OR THE LEGAL ENTITY THAT WILL BE UTILIZING THE SOFTWARE (REFERENCED BELOW AS “YOU OR YOUR”) ONLY ON THE CONDITION THAT YOU ACCEPT ALL OF THE TERMS OF THIS LICENSE AGREEMENT.